circumstances may necessitate her doing so, but that she shall at her decease leave them intact for the use & benefit of my said son in law & his wife Jacob & Margaret Wolfe. And I hereby declare that it is my desire & intention that my Wife shall live in unison with my son in law Jacob & his Wife Margaret Wolfe, and my said son in law Jacob Wolfe & his wife Margaret Wolfe shall as agreed with me & in consideration of the use of the means hereby bequeathed maintain & cherish my said Wife in a befitting manner, as if she was their own Mother², & leaving her in addition to her maintenance, a Weekly sum of Ten shillings for her own private purposes. And I hereby declare that I leave nothing to my daughter Sarah Perdue², or her heirs, I hereby declare that it is my desire that my remains shall be interred in the Cork new Wilton Cemetery in a suitable place & that the expenses of my funeral shall be paid out of the money belonging to the firm, And I also Will that my son Samuel Williamson & my daughter Rebecca Ann Williamson², now inmates of the Cork Lunatic Asylum, shall in the event of their decease, be provided with a decent burial, at the joint expense of my son in law Jacob Wolfe & my Wife Elizabeth Williamson. I appoint my brother William R Williamson³ of Worcester, England, & my friend Josh. D. Reddin of North Main St Cork jointly and severally Executors of this my last Will & testament. Dated this 10th day of January 1872. Samuel Williamson. 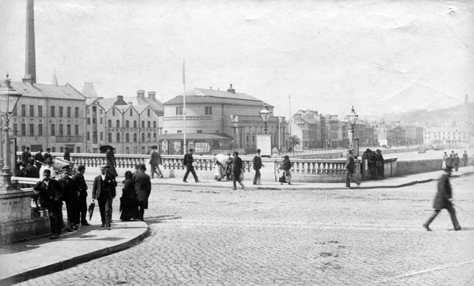 I hereby leave & bequeath to my son in law Jacob Wolfe, the lease of the premises 31 & 32 Lavitts Quay in the City of Cork, but my Wife Elizabeth Williamson shall be allowed as heretofore the entire use during her lifetime of the apartments now Occupied by us. My son in law Jacob Wolfe shall pay Rent and all Rates & Taxes due from time to time upon the said premises. Should my said son in Law Jacob Wolfe at any future time give up the premises 31 & 32 Lavitts Quay in the City of Cork & remain elsewhere during the lifetime of my Wife, then my Wife shall be provided by my said son in law with suitable accommodation in whatever house or houses he may reside in, in accordance with article 4. This Codicil is in addition to the former bequests. Henry Farman 22 Shandon St Cork. Reddin Executors who have duly renounced Probate and Execution of said will – that there is no residuary Legatee named therein and Be it further Known, that on the 18th day of June 1872, Letters of administration (with the said will and codicil annexed) of all and singular the personal estate and effects of the said deceased, were granted by Her Majesty’s Court of Probate to Elizabeth Williamson also of same place, Widow, the lawful widow of deceased and a Legatee named in said will she having previously been sworn well and faithfully to administer the same according to the tenor of the said will to pay the just debts of the said deceased, and to exhibit a true and proper inventory of all and singular the said personal estate and effects and to tender a just and true account thereof whence required by law so to do. It would seem that Samuel Williamson (in partnership with his son in law) had fairly extensive premises in an area that was possibly “on the up”. The will makes no reference to another premises, so we have to assume that Lavitts Quay was a manufacturing as well as a possible retail building. There is a possibility that cannot yet be excluded that this phrase was not just a reference to Jacob Wolfe (his son in law) but also to Margaret Wolfe (his daughter) – in which case Margaret might be a daughter by a relationship prior to Samuel’s marriage to Elizabeth. Margaret and Jacob were married in 1870 when Samuel was 43 and had been married to Elizabeth for 19 years (since 1851). It is possible but by no means certain that Margaret was Elizabeth’s child. His daughter Sarah Perdue was married to James in October 1857, six years after her father’s marriage to Elizabeth. If she was Elizabeth’s daughter (by Samuel) there must have been some reason preventing her parents’ marriage – possibly William was already married? However, it is far more likely that she was his daughter by a currently unknown previous wife. In might seem strange however that Samuel should require his widow to jointly fund the funerals of his two children in the Cork Lunatic Asylum (Samuel and Rebecca) if they were not hers. The first reference to “William R Williamson” is presumed to be a miss-transcription in the register as shown by the later reference to William B Williamson. The reference to “my brother William R Williamson of Worcester, England”, is the phrase I was hoping to find – this must be my great great grandfather, William Blizard Williamson, Tinplate manufacturer of Worcester in England. Samuel’s marriage record (see post: William Williamson of Cork) records his father as Thomas Williamson – my great great great grandfather. This will and codicil both written a few days before Samuel’s death is surprisingly harsh in respect of many of his children (leaving them nothing) and even with his favoured daughter, Margaret (and her husband Jacob Wolfe), it is possibly onerous in requiring them to accommodate and look after his wife (rather that providing sufficient to allow her to support herself independently). Perhaps he would not entrust the welfare of a possibly frail wife to anyone else? However his widow was not so frail that she could not successfully apply for and obtain letters of administration.